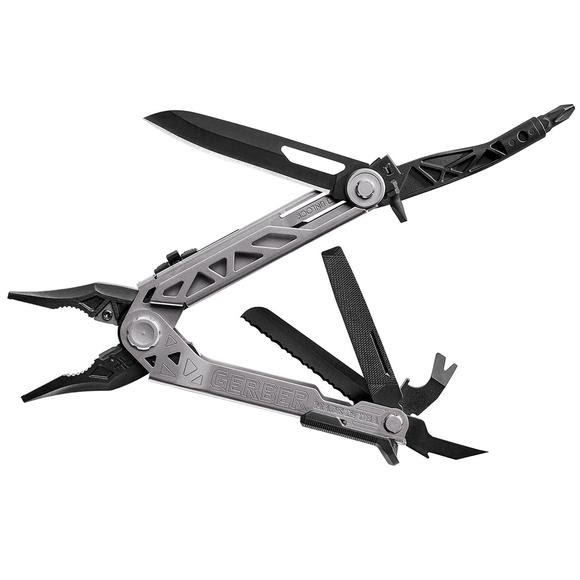 Gerber's Center-Drive multi-tool offers uncompromising performance through revolutionary design. The innovative center-axis driver opens to align like a real screw driver, yielding maximum torque and rotation. No productivity is sacrificed with the addition of a 30% longer outboard blade and one-thumb opening sliding jaws. Full size, real tools: the multi-tool just got a reality check. Gerber &apos;s Center-Drive multi-tool offers uncompromising performance through revolutionary design. The innovative center-axis driver opens to align like a real screw driver, yielding maximum torque and rotation. No productivity is sacrificed with the addition of a 30% longer outboard blade and one-thumb opening sliding jaws. Full size, real tools: the multi-tool just got a reality check. It seems obvious, but until now no multi-tool has ever offered a full size driver on the center axis with a standard bit. The resulti sall the ergononics and torque you&apos;d expect from the real thing, ready at the flick of a thumb. Dimensions Closed: 4.7", Open: 6.6"